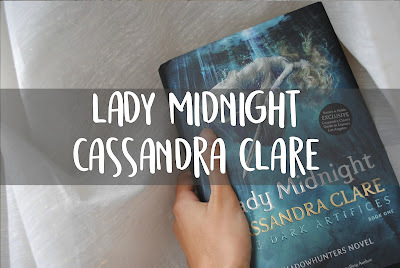 I finished Lady Midnight last night at around midnight (heh) and have been crying ever since. I am a huge fan of everything Shadowhunters, and I have been for several years now but I for some reason just never wanted to pick this book up? I kind of wanted to leave it and hope that everything was peaceful and happy. However, I KNEW that I had to read this after the amazing reviews it got and everyone saying how much Cassie's writing improved so yeah, I had to. And man I am so glad I did. ONTO THE REVIEW because I am overflowing with emotions that need to be typed out. I’ve always loved Annabel Lee — it has a high romanticism to it. It’s beautiful and haunting in ways that I hope to invoke in Lady Midnight and the other books of TDA. The ocean, forbidden love, devastating loss, the refusal to accept death, and lovers being forcibly separated are some of the “bones” of the poem that it shares with The Dark Artifices. And all the chapter titles being bits of the poem? Genius. I honestly couldn't tell you if I liked Jemma or not AND IT'S A PROBLEM. The way Cassie wrote it was so gorgeous it's like the words were literally melting off the page into my soul and IT WAS TOO GOOD. The way they described their love for each other. Love. ALL THE LOVE. But I felt like it was so incredibly predictable that they would get together and it's the whole foRBIdden LovE trope that I just don't want to have to deal with through the entirety of Lord of Shadows. what a great character. HE IS A BEAUTIFUL BEING THAT DESERVES EVERYTHING. His character is so complex and deep and lined with MYSTERY, I can't even absorb it all. He is a bisexual icon, and that is the greatest thing. Although what I really don't want to see is a stupid love triangle with Cristina, Mark, and Kieran (or maybe Diego instead of Kieran it may even be a square A LOVE SQUARE). no. I don't want it and I don't need it. Keep it far far away from my precious child. He deserves nothing but love and joy no suffering. Please. I am diversity in YA's biggest stan. I am ALWAYS here for it. AND ALL THE CHARACTERS IN THIS. yes. We had badass Mexican Cristina with her butterfly knives, we had bisexual Mark, we had an AMAZINGLY portrayed autistic character!!! WhICH IS TOO GOOD. I love how the autism wasn't what made Ty's character, because he was so much more than that, and YA authors tend to make autistic characters... nothing but autistic... which ruins it all? The second best thing about this book next to Cassie's improved writing was the big and gorgeous Blackthorn family. I love every single one of them, no exceptions. Mark, my beautiful half faerie legend. Julian, the mom we all need and want. Ty and Livvy, and Dru, and ADORABLE Tavvy, I love them all and nothing bad should ever happen to them. 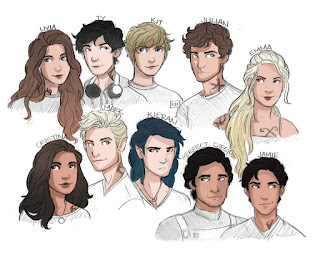 If I had the time to sit here and write about how much I loved each and every one of these characters, I would do it in a heartbeat, but I don't think I can sit at my computer for three weeks on end, but I love them, they're all so incredibly different and I want to learn MORE and MORE about them. The one thing that always set me off about City of Bones and City of Ashes was that Clary was just so annoying. Don't hate me and she definitely got better as the series went on, but in the first two books she was intolerable. Emma, on the other hand, is a total queen who for the most part, knows what she is doing. She's kind of aggressive at times, but I honestly thought it was kind of great. AND JULIAN. the perfect soft boy. I want nothing more in the world to see one of his paintings because the way that they are described makes my heart go SHWOOO! And he sounds like such a beautiful person, inside and out, and HE HAS SO MUCH DEPTH I want to know it all. MORE HERONDALES. NBFSKBNKWFDG YES. I got so excited at that scene that I almost dropped the 8505845 pound book. Also I kind of sensed some Kit and Ty action there which is more than my heart can bear because it would just be so perfect and maybe tropey but I don't even care. Although Johnny Rook kind of confused me??? I am seeking out for some explanation on who the heck he was. 676 pages? not loving it. The biggest downside of the book was how long it was. Someone please tell Cassie that she doesn't have to make her chapters 58705084 pages long and add so much unecessary detail. I love her writing, but sometimes she adds too much?? I swear every time I almost dropped the book I freaked because I'm pretty sure it was going to break my feet. the parabatai curse thing? not loving it. I was eagerly waiting the entire book to see why parabatai couldn't get together, because I knew it was coming, and I wanted it to be good. But it wasn't enough for me. They get too powerful and then go crazy? IT DOESN'T MAKE SENSE TO ME. Something like they'd lose power would make more sense for me?? am i crazy, probably, bUt I just didn't like it. And the whole Clave hating love thing? Sheesh. villain cliche speech thing? not loving it. At the end, Cassie chose to put this whole speech where Malcolm explains his evil plan MUAHAHAHA. yeah. i hated it. That's literally the biggest cliche in the book, I get it was a way to explain his evil plan MUAHAHAHA but doing it that way? Lame and overused. Have your eyes been graced by the glory that is Lady Midnight? Which Blackthorn is your favorite? Yes Jemma or NO PLS KILL IT Jemma? ALSO almost February, I hope your Januarys were amazing!! i love this post so much - i just finished lady midnight as well and i am INTERNALLY SCREECHING. i'm not sure whether to ship jemma yet, but i guess we'll see in lord of shadows. JEMMMMMMAAAAAAAAAAa <3 I honestly love The Dark Artifices series but be prepared for so many feels in book 2 I just could not deal arghjkbs. I also agree with the Clary statement, I've only read the first book since I started the tv series and once I got past the cringiness I got so into it I'm not reading the other books until s3 comes out and I finish it lol. She just wasn't the badass character she could of been and I found her to weak, Emma on the other hand shows weakness but is stronger because of it if you get what I mean? UGH I still need to read Lady Midnight but there are way too many books AGH!! !